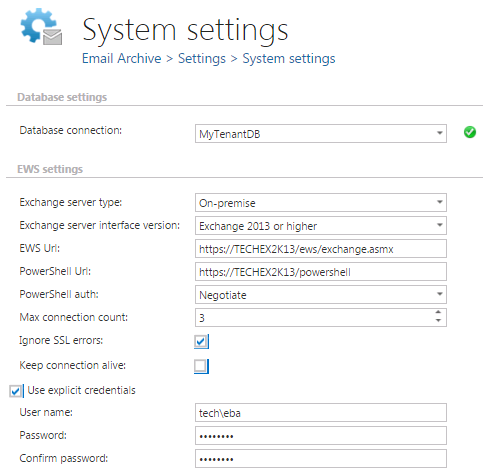 On the Email Archive => Settings => System settings page, under EWS settings, set the Exchange version to the highest Exchange version that you use and specify an EWS user, who has the necessary rights on this Exchange server. On the same Email Archive System settings page, in section General settings, allow to archive public folders and set the public folder owner’s email address. This is the email address of a user, who is hosted by the Exchange server containing public folders. Set the email archive provisioning standardly and start the provisioning job – all the Exchange server mailboxes will be read and written to the contentACCESS Address book. First the higher versions are synchronized, then the lower versions follow. Go to the Address book. The Exchange server section features all synchronized servers. By default, the system uses the default EWS URL previously set on the System settings page (EWS settings section) to connect with the respective Exchange mailboxes. 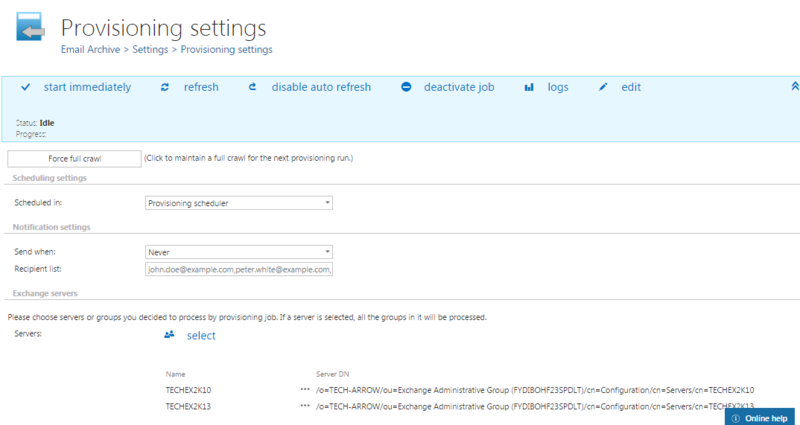 Set the right EWS URL for all your Exchange servers using the “Change server settings” context menu option. Configure the archive job and archive both your standard mailboxes (from Exchange server 2013) and public folders (from Exchange server 2010).